Mandibular second premolars (MSPs) have varied anatomy ranging from 1 to 3 roots and 1–5 canals. Successful endodontic treatment is achieved by proper access opening, cleaning, and shaping and three-dimensional obturation. This case series describes five cases in which MSPs have been diagnosed with aberrant canal system. The Case 1 and 5 has one root with Vertucci's Type V canal configuration. The Case 2 has two roots with two canals, the Case 3 has one root with Vertucci's Type IV canal configuration, whereas the Case 4 has three roots with three canals. This case series also describes a classification for describing the root configuration. The clinical implications of this paper are first to reach at appropriate diagnosis of canal system using diagnostic aids (angulated radiographs and dental operating microscope). Second, to use advanced endodontic instruments for achieving successful endodontic therapy (NiTi rotary instruments). Thorough knowledge of internal anatomy of root canal system makes endodontic treatment successful., Understanding the presence of aberrant internal root canal morphology contributes toward success and increases overall prognosis of endodontically treated teeth. There are numerous documented studies (in vitro and in vivo),,,,,,,,,,,,,,,,,, [Table 1], case reports ,,,,,,,,,,,,,,,,,,,,,,,, [Table 2], and literature review , [Table 3] describing aberrant canal systems in mandibular second premolars (MSPs). Studies have also shown that the canal system varies according to gender, race, ethnicity and syndromes. The aberrant canal anatomy has been observed in each tooth as in number of roots, canals, isthumi, and apical foramen. Mandibular first premolar has varied variation in root canal system, so it is known as enigma to endodontists. However, various studies and case reports stated varied anatomy with MSP, so this tooth can also be considered as enigma to endodontist. MSP usually have two pulp horns, the buccal located at a higher level than the lingual. Usually, MSP has single root and single canal (97.5%), however, incidence of two (2.5%), three (0.4%), and four roots were also found. Accessory apical foramen was seen in 47% of MSPs. Recently, Singh and Pawar observed that MSPs showed single root in 92% and >2 roots in 8%, 58% had one apical foramen, and 12% showed two apical foramen in South Asian population. 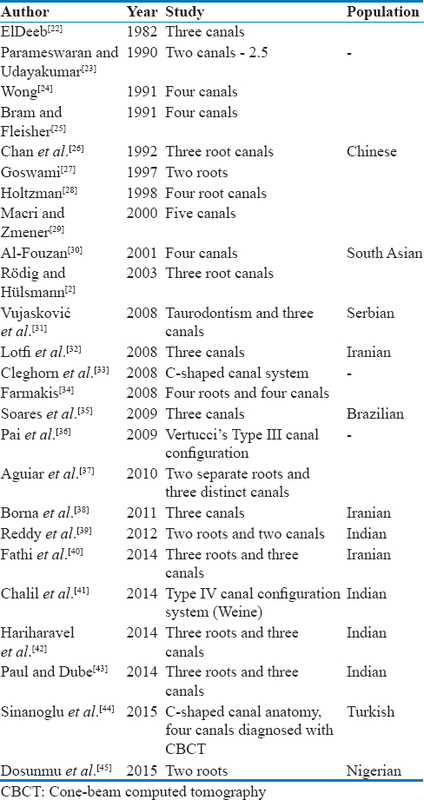 The canal system can be described using classifications (Vertucci's and Weine's) whereas the number of roots can be described by using [Table 4] classification. The presence of aberrant anatomy can be diagnosed by textbook knowledge. The in vitro methods are clearing technique, sectioning and scanning electron microscopy analysis, and the techniques that can be used both in vitro and in vivo are exploration, radiography, cone beam computed tomography (CBCT), and microCT. The clinical techniques are radiographs in different angulation (SLOB rule), radiopaque dyes, loupes, and dental operating microscope (DOM). The present article focuses on five cases of MSP showing varied root and canal anatomy. A elder female patient reported to the Department of Conservative Dentistry and Endodontics, with the chief complaint of pain and decayed tooth in lower left back tooth. The patient gave a history of continuous dull, gnawing pain. On intraoral examination, disto-occlusal caries was seen with tooth #35, and tenderness on percussion was present. Pulp test (electric and cold) showed delayed response. Radiographically, disto-oclusal radiolucency was involving pulp, and periodontal widening was present in the apical third [Figure 1]a. A diagnosis of symptomatic irreversible pulpitis with symptomatic apical periodontitis was made having Vertucci's Type V canal configuration. Nonsurgical root canal therapy (NSRCT) was planned with 35. Local anesthesia was administered and isolation was done with rubber dam. Complete carious removal was done and distal wall build was done with glass ionomer [Figure 1]b. The access cavity preparation was done under DOM and canals were accessed with #10 K file. Working Length was achieved with the apex locator (Root ZX, J. Morita Inc., USA) and radiograph was taken [Figure 1]c. Cleaning and shaping were done in crown down technique with HERO shaper file system. Irrigation protocol was followed as described by Zhender 2006, with the help of NaOCl, ethylenediaminetetraacetic acid (EDTA), and normal saline. Master cone radiograph was taken [Figure 1]d, and obturation was done using gutta-percha and AH plus sealer. Onlay was done as final restoration [Figure 1]e.
A 26-year-old male patient reported with the chief complaint of pain and decayed tooth in lower left back tooth. The patient gave a history of sharp, piercing, and shooting pain which was not relieved on having medications. On clinical examination, disto-occlusal caries was seen with tooth #35. Pulp vitality test (cold and electric) showed painful response. Radiographically, distal caries was approaching buccal pulp horn [Figure 2]a. A diagnosis of symptomatic irreversible pulpitis was made, and were having two roots ie. Type 2a (Classification according to [Table 4]). Endodontic treatment was planned. Local anesthesia was administered; isolation was done with rubber dam and caries was removed. Intrapulpal anesthesia was given and access cavity preparation was completed under DOM [Figure 2]b. The canals were accessed with no 10 K file, working length was achieved with apex locator, and radiograph was taken [Figure 2]c. 3% NaOCl, EDTA, and normal saline were used for cleaning, and crown-down technique (ProTaper, Dentsply, Maillefer, Ballaigues, Switzerland) was used for shaping the canal system. Master cone radiograph was taken [Figure 2]d and obturation was done with gutta-percha and AH plus sealer. Postendodontic restoration was done with silver amalgam [Figure 2]e.
A 45-year-old male patient was referred to the department for intentional NSRCT with 45. A preoperative radiograph was taken [Figure 3]a. Isolation was done with rubber dam after administration of local anesthesia; access cavity was prepared. Working length was determined with apex locator and radiograph was taken [Figure 3]b. Cleaning and shaping were done with ProTaper Next file system using 3% NaOCl, normal saline, and EDTA. Ultrasonic agitation was done. Obturation was done with gutta-percha and AH sealer [Figure 3]c. Silver amalgam was used as postendodontic restoration. This case demonstrates two apical foramen [Figure 3]d.
A 33-old-male patient reported to the department with the chief complaint of pain in lower left back region of jaw. The patient gave a history of continuous throbbing and nocturnal pain. On clinical examination, disto-oclusal caries was present with 35. Radiograph revealed deep disto-oclusal caries involving pulp and unusual root anatomy that is three roots were seen (Type 3a) [Figure 4]a. Local anesthesia was given, isolation was done, and carious tooth structure was removed. The missing tooth structure was restored with glass ionomer. Access opening was done and root canal orifices were explored following developmental grooves. The three canals were located, and working length was achieved with apex locator confirmed by radiograph [Figure 4]b. ProTaper file system was used for cleaning and shaping with intermittent irrigation with NaOCl, EDTA, and normal saline. Obturation was done using gutta-percha and AH plus sealer. Composite resin was used as postendodontic restorative material [Figure 4]c.
A 35-year-old female patient reported with the chief complaint of pain in the lower right back region. The patient gave a history of intermittent pain which aggravated on having cold and sweet food. Vitality test (electric and cold) gave painful response. Radiograph revealed deep mesio-occlusal caries and aberrant canal anatomy (Type 2a) with 45 [Figure 5]a. A diagnosis of symptomatic irreversible pulpitis was made. Local anesthesia was administered, and rubber isolation was done. Working length was determined using apex locator [Figure 5]b, and cleaning and shaping were done using HERO shaper file system. Irrigation was done with NaOCl, EDTA, and normal saline. The obturation was done with corresponding gutta-percha and AH plus sealer. Composite resin was used as postendodontic restorative material [Figure 5]c.
The root canal system comprises of complex anatomical features where the presence of extracanals is an endodontic challenge. The canal systems were classified by Weine  and Vertucci, respectively. Endodontic success depends on many factors; nevertheless, 42% of endodontic retreatment is because of missed canal. This diagnosis of aberrant root canal anatomy clinically starts from first step that is preoperative intraoral periapical radiograph. If there is overlapping of roots or if the radiograph shows unusual finding, then radiograph shall be taken following Clark's rule. Exploration of root canal orifices also plays an important role for diagnosing extracanals. This orifice can also be located by dentinal mapping and developmental grooves. DOM and CBCT help in easy diagnosis of aberrant root canal system. The use of electronic apex locators helps in accurate determination of working length. The ease of cleaning and shaping is achieved by NiTi file system, further decreasing the time required for completion of endodontic treatment. All of this enhances the chance of successful endodontic treatment. ElDeeb for the first time treated MSP with three canals. A maximum of 5 canals have been reported in MSP. The Case 1 and 5 describe Vertucci's Type V canal configuration where the canal bifurcates at middle third of root. The second canal was explored under magnification by DOM  and enlargement of canal till the furcation area. The Case 2 describes Vertucci's Type IV canal configuration and was treated conventionally. The Case 3 was endodontic challenge as it showed Vertucci's Type II classification with two apical foramina. Cleaning of apical foramina was successfully achieved by ultrasonic agitation which was then filled with obturating material. The Case 4 describes Type 3a root configuration, where two roots were present distally and one mesial. The Case 5 describes Vertucci's Type V configuration. Each case followed the irrigation protocol as described by Zehnder. The paper points were used for removing excess moisture from the canals. Obturation was done using lateral compaction technique for Case 1, 2, 4, and 5. The basics of endodontic therapy begin with appropriate diagnosis and treatment plan with proper knowledge of root canal system. Advanced equipments such as DOM, NiTi file systems, ultrasonics, and obturating system contribute to successful endodontic treatment. Aberrant anatomical variation if misdiagnosed leads to failure and if diagnosed correctly leads to successful treatment. Rödig T, Hülsmann M. Diagnosis and root canal treatment of a mandibular second premolar with three root canals. Int Endod J 2003;36:912-9. Amos ER. 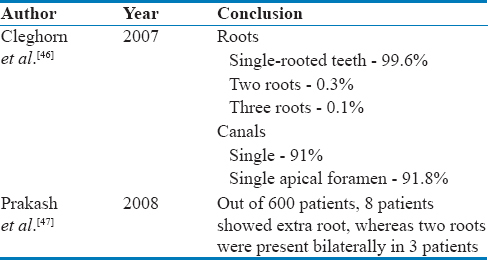 Incidence of bifurcated root canals in mandibular bicuspids. J Am Dent Assoc 1955;50:70-1. Zillich R, Dowson J. Root canal morphology of mandibular first and second premolars. Oral Surg Oral Med Oral Pathol 1973;36:738-44. Kerekes K, Tronstad L. Morphometric observations on root canals of human premolars. J Endod 1977;3:74-9. Vertucci FJ. Root canal morphology of mandibular premolars. J Am Dent Assoc 1978;97:47-50. Martínez-Lozano MA, Forner-Navarro L, Sánchez-Cortés JL. Analysis of radiologic factors in determining premolar root canal systems. Oral Surg Oral Med Oral Pathol Oral Radiol Endod 1999;88:719-22. Lombart B, Michonneau JC. Premolar anatomy and endodontic treatment. Rev Belge Med Dent (1984) 2005;60:322-36. He BZ, Yin XZ, Zhang CF. Clinical evaluation of the effect of angulation apical X-rays and the X-rays with file in diagnosing multiple canals in mandibular anterior teeth and premolars. Zhonghua Kou Qiang Yi Xue Za Zhi 2006;41:160-3. Awawdeh LA, Al-Qudah AA. Root form and canal morphology of mandibular premolars in a Jordanian population. Int Endod J 2008;41:240-8. Rózyło TK, Miazek M, Rózyło-Kalinowska I, Burdan F. Morphology of root canals in adult premolar teeth. Folia Morphol (Warsz) 2008;67:280-5. Baroudi K, Kazkaz M, Sakka S, Tarakji B. Morphology of root canals in lower human premolars. Niger Med J 2012;53:206-9. Llena C, Fernandez J, Ortolani PS, Forner L. Cone-beam computed tomography analysis of root and canal morphology of mandibular premolars in a Spanish population. Imaging Sci Dent 2014;44:221-7. Singh S, Pawar M. Root canal morphology of South Asian Indian mandibular premolar teeth. J Endod 2014;40:1338-41. Ok E, Altunsoy M, Nur BG, Aglarci OS, Çolak M, Güngör E, et al. A cone-beam computed tomography study of root canal morphology of maxillary and mandibular premolars in a Turkish population. Acta Odontol Scand 2014;72:701-6. Kazemipoor M, Hajighasemi A, Hakimian R. Gender difference and root canal morphology in mandibular premolars: A cone-beam computed tomography study in an Iranian population. Contemp Clin Dent 2015;6:401-4. ElDeeb ME. Three root canals in mandibular second premolars: Literature review and a case report. J Endod 1982;8:376-7. Parameswaran A, Udayakumar P. Bifid root and root canal in mandibular second premolar and its management – A case report. Fed Oper Dent 1990;1:25-7. Wong M. Four root canals in a mandibular second premolar. J Endod 1991;17:125-6. Bram SM, Fleisher R. Endodontic therapy in a mandibular second bicuspid with four canals. J Endod 1991;17:513-5. Chan K, Yew SC, Chao SY. Mandibular premolar with three root canals – Two case reports. Int Endod J 1992;25:261-4. Goswami M, Chandra S, Chandra S, Singh S. Mandibular premolar with two roots. J Endod 1997;23:187. Holtzman L. Root canal treatment of mandibular second premolar with four root canals: A case report. Int Endod J 1998;31:364-6. Macri E, Zmener O. Five canals in a mandibular second premolar. J Endod 2000;26:304-5. Al-Fouzan KS. The microscopic diagnosis and treatment of a mandibular second premolar with four canals. Int Endod J 2001;34:406-10. Vujasković M, Karadzić B, Miletić V. Root canal treatment of mandibular second premolar tooth with taurodontism. Srp Arh Celok Lek 2008;136:280-3. Lotfi M, Vosoughhosseini S, Zand V, Fatemi A, Shyezadeh V, Ranjkesh B, et al. A mandibular second premolar with three canals and atypical orifices. J Oral Sci 2008;50:363-6. Farmakis ET. Four-rooted mandibular second premolar. Aust Endod J 2008;34:126-8. Soares LR, Arruda M, de Arruda MP, Rangel AL, Takano E, de Carvalho Júnior JR, et al. Diagnosis and root canal treatment in a mandibular premolar with three canals. Braz Dent J 2009;20:424-7. Pai AE, Gautam S, Kundabala M. The retreatment of a mandibular second premolar with unusual canal anatomy. Kathmandu Univ Med J (KUMJ) 2009;7:298-300. Aguiar C, Mendes D, Câmara A, Figueiredo J. Endodontic treatment of a mandibular second premolar with three root canals. J Contemp Dent Pract 2010;11:078-84. Borna Z, Rahimi S, Shahi S, Zand V. Mandibular second premolars with three root canals: A review and 3 case reports. Iran Endod J 2011;6:179-82. Reddy SJ, Chandra PV, Santoshi L, Reddy GV. Endodontic management of two-rooted mandibular premolars using spiral computed tomography: A report of two cases. J Contemp Dent Pract 2012;13:908-13. Fathi Z, Rahimi S, Tavakoli R, Amini M. A three-rooted mandibular second premolar: A case report. 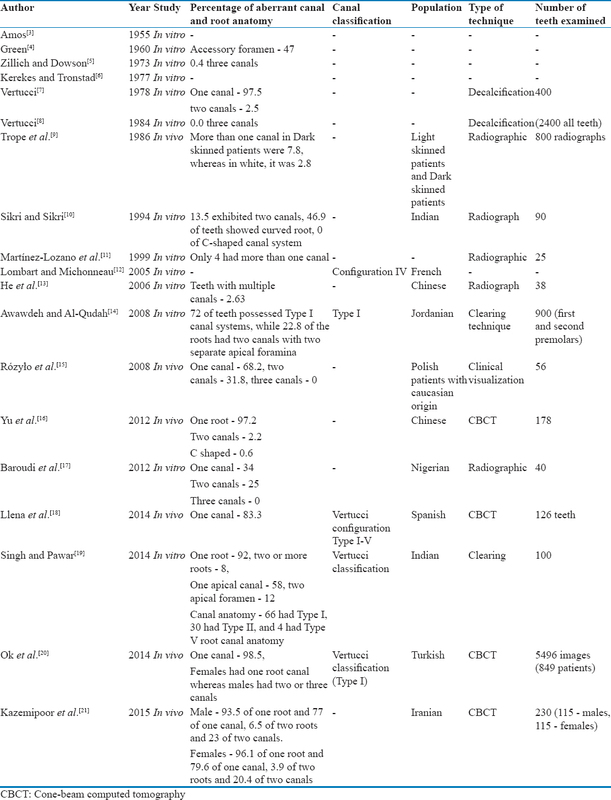 J Dent Res Dent Clin Dent Prospects 2014;8:184-6. Chalil NM, Kini S, Jose S, Narayanan A, Salahudeen S, Peedikayil FC, et al. Endodontic treatment of a mandibular second premolar with type IV wiene's root canal: A case report. Case Rep Dent 2014;2014:731467. Hariharavel VP, Kumar AA, Ganesh C, Annamalai S, Ramar K, Aravindhan R, et al. Root canal treatment of mandibular second premolar with three separate roots and canals using spiral computed tomographic. Case Rep Dent 2014;2014:816576. Paul B, Dube K. Endodontic treatment of a mandibular second premolar with three roots and three canals. Case Rep Dent 2014;2014:973410. Sinanoglu A, Helvacioglu-Yigit D, Mutlu I. Use of cone-beam computed tomography and three-dimensional modeling for assessment of anomalous pulp canal configuration: A case report. Restor Dent Endod 2015;40:161-5. Dosunmu OO, Sulaiman AO, Olasemi FS. Mandibular premolars with multiple roots: A case report. Niger Postgrad Med J 2015;22:126-8. Cleghorn BM, Christie WH, Dong CC. The root and root canal morphology of the human mandibular second premolar: A literature review. J Endod 2007;33:1031-7. Prakash R, Nandini S, Ballal S, Kumar SN, Kandaswamy D. Two-rooted mandibular second premolars: Case report and survey. Indian J Dent Res 2008;19:70-3. Weine FS. Endodontic Therapy. 5th ed. St. Louis: Mosby-Yearbook Inc.; 1996. p. 243. Hoen MM, Pink FE. Contemporary endodontic retreatments: An analysis based on clinical treatment findings. J Endod 2002;28:834-6.